Stephen Langton (c.1150-1228) was an Archbishop of Canterbury. During his life he came into conflict with King John, and spent many years in exile because of this. King John’s reign had become increasingly tyrranical and Langton opposed this. 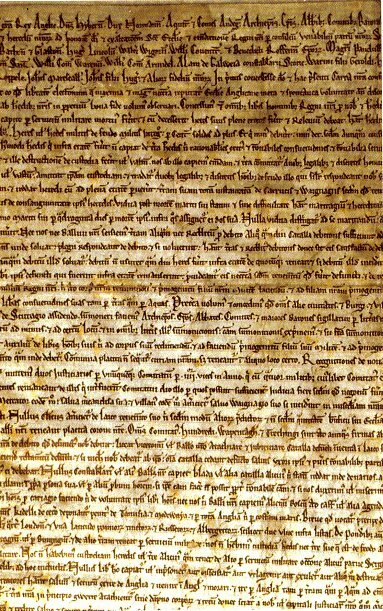 In 1215 he brought together the so-called Feudal Barons and with them drew up Magna Carta, a charter which sought to limit the powers of the monarchy. They imposed this on King John and he duly signed it at Runnymede in 1215. While Magna Carta is probably the most famous – and most important – of the documents associated with Langton, he was a prolific writer. He left behind glosses and commentaries on the books of the Old Testament, sermons, histories, poems and hymns. A hymn of his still in use is ‘Veni Sancte Spiritus‘. This hymn was translated into English as ‘Come, Thou Holy Spirit, Come’ by Edward Caswall (1814-1878), and is usually sung to a tune called VENI SANCTE SPIRITUS by Samuel Webbe (1740-1816). It is an invocation to the Holy Ghost and is associated with the feast of Pentecost. 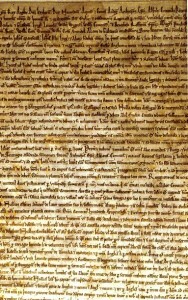 Magna Carta. Only four copies are left in the world: Salisbury and Lincoln cathedrals have one each, and two are kept at the British Library.